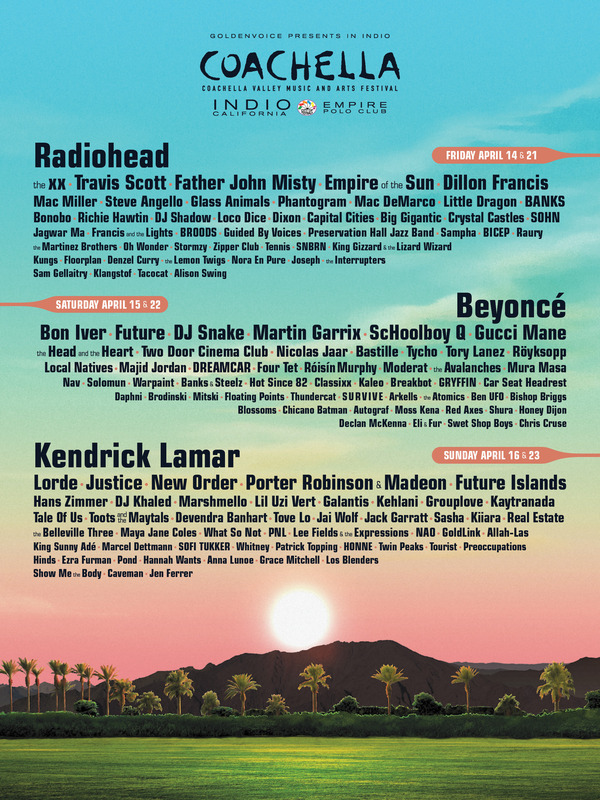 Coachella Lineup: Beyoncé, Radiohead, Kendrick Lamar and…Hans Zimmer? This year's edition of the festival takes place April 14 – 16 and April 21 – 23. Beyoncé, who’s headlining the second night of the festival, made brief appearances during her husband Jay Z’s set in 2010 and her sister Solange’s gig in 2014, but this marks her first official appearance. Radiohead and Lamar have both performed at the desert festival, however, and the two will headline the final night. Coachella once again takes place over two weekends at the Empire Polo Club in Indio, California this year: April 14 – 16 and April 21 – 23. New Order, Lorde, Bon Iver, Travis Scott, Father John Misty, Dillon Francis, DJ Snake, Gucci Mane, Justice, Madeon and Future Islands are among the many other performers scheduled to perform.